Red Bull Racing has been on the Formula One scene since 2005. And in that time Red Bull has won four constructor championships while also having a driver in Sebastian Vettel win four Formula One Championships as well. But Red Bull began to slip when Vettel decided to leave in favor of Ferrari in 2014 with the last two years have been dominated by Mercedes and their marquis driver Lewis Hamilton. And even though that Mercedes will more than likely win both the driver and constructor championships here in 2016, Red Bull is closing the gap. When Vettel left Red Bull, it opened the door for Daniel Ricciardo to become the team’s marquis driver. In 2014, Ricciardo won three races as he finished third in the driver standings. But the gap between Ricciardo and the two Mercedes drivers in Hamilton and Nico Rosberg who finished ahead of him in the driver’s standings was huge. That large gap would get larger in 2015 as Ricciardo finished eighth in the driver’s standings, while Red Bull took fourth in the constructor’s standings as Mercedes was leaving them in the dust. And although that Hamilton and Rosberg are first and second here in 2016, that gap between Mercedes and Red Bull is shrinking. 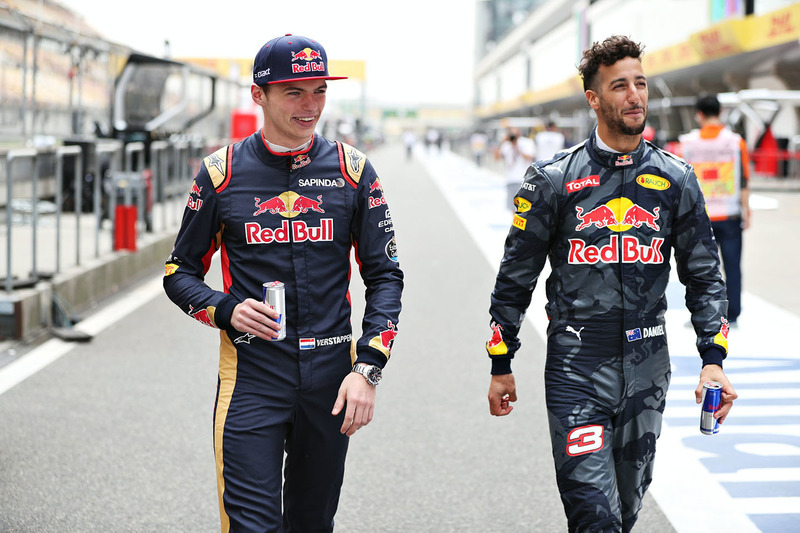 Red Bull decided to make the change from Daniil Kvyat to the 18-year old Max Verstappen to team with Ricciardo for the fifth race of the year in the Spanish Grand Prix. The race in Barcelona was highlighted by Hamilton and Rosberg crashing at the beginning of the race which left things up for grabs as far as who the winner would be. And it was Verstappen who turned heads on the track that day as he made his Formula One debut in a very loud fashion by winning the race. Since the Spanish Grand Prix, Mercdes has won each race, but Red Bull has been there with them on the podium which was highlighted by Ricciardo and Verstappen taking second and third respectively yesterday at the German Grand Prix. Ricciardo is currently 65 points behind Rosberg for second place in the driver’s standings. But with the current struggles of Rosberg who took fourth yesterday on his home soil of Germany, there is the possibility that Ricciardo could catch him for second place by season’s end. Mercedes will more than likely win the constructor’s championship once again, but Red Bull is currently in second place with their chief competition being Ferrari. This is the same Ferrari team that Vettel left Red Bull for as he felt that they were on their way down. But the future of Red Bull is bright with the racing ability of Ricciardo and Verstappen who are guided by the team’s chief technical officer Adrian Newey and they could be ready to make a surge in the second half of the season. After yesterday’s race, the action on the track will cool down for the summer break as the next race won’t take place until August 28 in Belgium. But Red Bull has plenty of momentum for themselves as they will look to continue battling Mercedes for podium spots and prestige on the Formula One circuit.